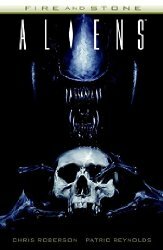 During a vicious xenomorph outbreak, terraforming engineer Derrick Russell leads a desperate group of survivors onto a rickety mining vessel. They hope to escape the creatures overrunning their colony-but they'll face horrors both in space and on the strange planet where they crash. Ties in with the Prometheus and Aliens films! Collects the four-issue miniseries.